EMPTY is a Black Metal band from Zaragoza, Aragon Spain that formed in 1995. 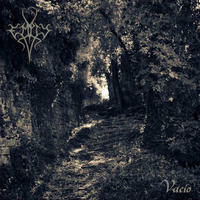 “Vacio” is their fifth full-length recording. The album is an aural trail of melancholy and sardonic spite. The listener is truly transported to another dimension where halves are wholes and night is day. There is no box to think outside of. Let the creativity flow. The first track, “Yellow Rain” did not prove insightful as to the title’s meaning for it’s a three-minute instrumental full of sound effects and oppressing atmosphere. “Empty,” the second track began and at once, it was impossible not to be taken completely by the cold, vehement sound. This is truly the music of cosmic nihilism. The band indeed has its own unique take on Extreme Metal. toward the song’s middle, an active brilliantly fluid bass line drives things forward as guitar chords hang like cypress trees over the path of the song. Hearing the dreary, grimy guitar with puny, fingerstyle bass guitar is inspiring in its unique craftsmanship. “The rope at the mill” is the third track, a unique tune with a winding melody that moves the song forward in all directions. Indeed, the most hi-def instrument is the bass as it punches through the mix with a methodical violence. One of the more challenging songs on the album is track six, “The pilgrim of desolation”. Mostly constructed of clean guitars for the first few minutes, it is at the 3:30 spot where the Black Metal comfort zone is revisited. The guitar solo toward the end of the song is melodically challenging and aurally pleasing. The final track Is “Deathlorn”. The gentle, ominous tremolo-picked phrase set against clean chords is the most memorable, entrancing moment on the album. The vibe is like that from soundtracks to classic movies from “The Omen” to “The Godfather”. When the heaviness kicks in, the spell is justly intensified. That same melody reigns throughout the near-five minutes of length to this song. What is interesting is the symbiotic relationship between guitar and bass. Instead of fighting for space, the two instruments reside in their own area of the frequency, each clearly discernible all of the time. There certainly is enough frequency for everyone! At times, one is reminded of BETHLEHEM with moments of ARCTURUS, bits of ABIGOR, and a touch of SOLEFALD. The point is that this is forward-thinking, hyper-intelligent Black Metal. The two musicians have a successful rapport as their chosen phrases play with each other as they weave through varying chords and motifs. No, this is not for everyone and one cannot help but be thankful for that. EMPTY are full of their own trademarked tactics of blending Black Metal with the Avant Garde and a symphonic flare. For those wanting a challenging, immersive experience, guaranteed to perplex, inspire, and transcend the mundane, this is an album that must be owned.